Fun to see Ms. Andrea Torres and Lharby Policarpio this afternoon at the CAVE in Tomas Morato. We were there to interview them for their film MEANT TO BEH which is the comback movie of Vic Sotto while he's paired with the timeless Ms. Dawn Zulueta. 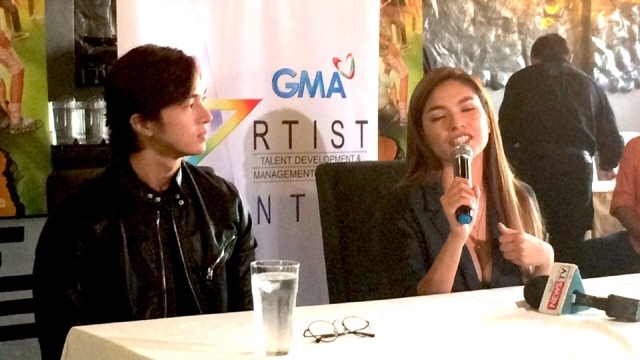 Andrea Torres says "I am not a bad person here, not negative at all but I will wreak havoc with their relationship. I have been part of MMFF previously, like 10 years ago. I feel this is a blessing to end the year and I am excited. I was a bit stiff in the beginning, thinking of what to say or do Bossing Vic was already breaking the ice. How I wish we could get to do the bonding we did in Baguio, I miss them a lot. I have done comedy before since I am part of Bubble Gang, but of course I was still star struck because they are who they are. Ms. Dawn was so funny too and you can't compare it with what she portrays in real life. I am so glad about their feedback because that's what I wanted to do. I am also shocked at how they treat you like friends. Baste is like a baby brother, such a good kid to actually be with because he always never forget to share food when he's about to eat, he's certainly going to be adored by a lot of people. I am also going to gift myself with an out of the country trip, I think I owe it to myself to be with my folks and my brother. I am really looking forward to another MMFF eventful week. This is a G movie, you will expect the whole family to be there and I am excited to see them watch the film. You'll see this to be blessed in the box office, I wish he could win the best actor trophy. Just to be part of the project was a dream for me, but if ever I win the best supporting actress category would make me really happy. About the Bench Fashion Show, you just would never forget a moment like that. Their feedback was all good and if you were in the back stage, you wouldn't see anything like that because everyone was so nice and they were giving me food left and right, it was just like a celebration for Bench's 30 years." Lharby Policarpio was also with us that afternoon and he says "I play Brad here and is a school bully. We have our own story inside the actual film. This is my first time to do an MMFF entry do getting to work with them was a dream for me. Though I was a college bully, it was more concentrated with JC and I did mistreat them a lot. The set is happy because from the director to the stars, they were all cracking jokes. Sue is remarkable, she's like one of the boys. She jokes a lot even if we are changing clothes, she's so chill and she doesn't make you feel that she's a big star. I also can't wait to travel because I do that quite often, for Christmas I wish that I would have time for that. This film is relateable and fun, like what any Vic Sotto project you have seen in the past but with more heart, more inspiration. We are sure this will earn a lot, but the awards will just be a reward for us. We hope you watch the film if you want to get inspired, a little touch of romance and learn about real family relationships." MEANT TO BEH will be shown on December 25 and will also star Gabbi Garcia, Ruru Madrid, Sue Ramirez, Daniel Matsunaga and supee cute Baste. Bring your family and friends please!